With the Chromecast 2 and Chromecast Audio dongles now freely available from the Google Store, as well as retailers like Best Buy in the US, the team at iFixit has taken the opportunity to take a peek under the hood and see what makes the devices tick. The iFixit team don’t give repairability scores for any of the Chromecasts, including the original from 2013. The team says there is very little to repair in the event of an internal failure – and that’s basically true, although they do give kudos to the internally detachable HDMI cable on the Chromecast 2 which should give longevity to the device in the event of an incident with the HDMI port. 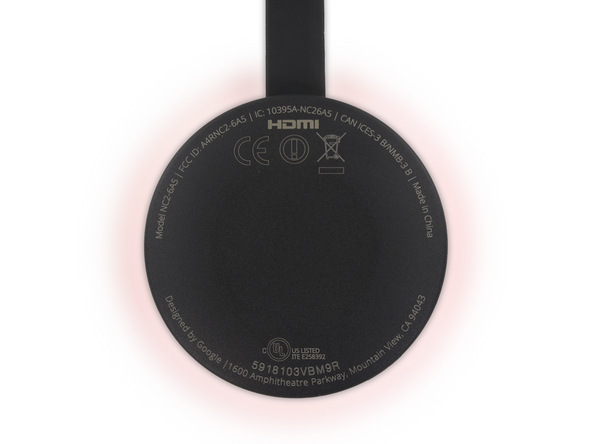 On the rear of the Chromecast 2 we find a new model #: NC2-6A5 which after the H2G2-42 Hitchhikers Guide to the Galaxy reference of the original has us scratching our heads over its importance. If you have any ideas we’d love to hear them. So, what did they find under the hood? Well, the units both have the same processor under the hood, in this case a Marvell Armada 88DE3006 1500 Mini Plus dual-core ARM Cortex-A7 media processor. The Chromecast 2 has double the RAM of the Chromecast audio with 4GB of Samsung DDR3L SDRAM vs the Chromecast Audio’s 2Gb EKDDR3L SDRAM – a big update from the 512MB RAM on the original. Both the devices have 2GB of NAND Flash Memory on-board as well as the same Marvell WLAN, Bluetooth, NFC and FM Receiver. Where the devices differ is with the audio internals, with the Chromecast Audio getting a little bit more hardware in that department with an AKM AK4430 192kHz 24-Bit Stereo DAC and a Texas Instruments DRV632 DirectPath 2-VRMS pop-free stereo line driver. The construction of the Chromecast and Chromecast Audio reveals a good deal of hubba bubba Thermal Paste inside the devices, as well as a well positioned 3-antenna system for better wi-fi controls. For the US$35 price tag on both the devices – which is expected to be $49 when it reaches Australia, you’re not going to really be repairing the Chromecast 2 or Chromecast Audio, but it is nice to see the internals and see the updates done to the hardware. We’re very interested in finding out a launch date in Australia for the Chromecast, but we’ll have to wait just a little while longer. Hang on, are you sure about that memory? iFixit reports it as a K4B4G1646D-BY device, which is a 4Gb unit, not 4GB. Divide by 8 and you get 512MB, same as before. It would also mean the Audio only has 256MB. I’d love to hear if the new Chromecast has a noticeable performance increase over the older one. I’d love to hear if it actually works properly with Google Play Music. The current model keeps stopping after playing 2 or 3 songs. People have been complaining about it but it’s not fixed. So I have to use the Bluetooth capability of my receiver with Google Play Music which defeats the point of having a Chromecast.